How do Ebb and Flood Grow Systems Work? A set timer triggers the pump, which then floods the bottom of your chosen growing medium and stale air is pushed out. Gravity removes the excess solution and brings it back to the tank alongside fresh air. This allows for the roots to take up all the water and the nutrients that they need, with the growing medium flooded up to two thirds, while the system is drained (ebbs) and provides fresh oxygen to the roots. Plant roots become highly oxygenated and provide bigger yields than traditional soil growing. Ebb and Flood provide you with more versatility and flexibility when it comes to growing plants, as you can provide yields with the perfect growing conditions. Tiy can easily alter both the duration and the frequency of feeds for optimised nutrient intake and maximised yields. Grow your plants in individual pots with growing media like clay, rockwool, or coco, allowing you to move your plants when they require. Our Ebb and Flood system is built to last you for decades, including its high-performance fittings and high-quality pumps with unrivalled reliability. Ebb and Flood growing systems are extremely efficient and effective due to the high amount of oxygen provided to the plant roots. With traditional growing, the oxygen content of the roots is often reduced due to the media becoming saturated. Providing more oxygen increases nutrient and water intake and, ultimately, leads to bigger yields. Every feed contains fresh oxygen-rich air, which prevent root diseases from taking hold, as they can’t survive in such an oxygen-rich environment. Monitoring your plants’ needs will help you have both extremely productive and healthy plants. Keep a record of these floods, so you can compare their number to how much solution is needed each day to top up the system. The more solution you add, the faster your plants’ growth rate: maximised consumption will maximise the growth. Make sure to experiment with both the duration and the number of floods to guarantee your plants receive the optimum amount of floods for their best growth environment. Your flood records will help you become more and more accurate over time. 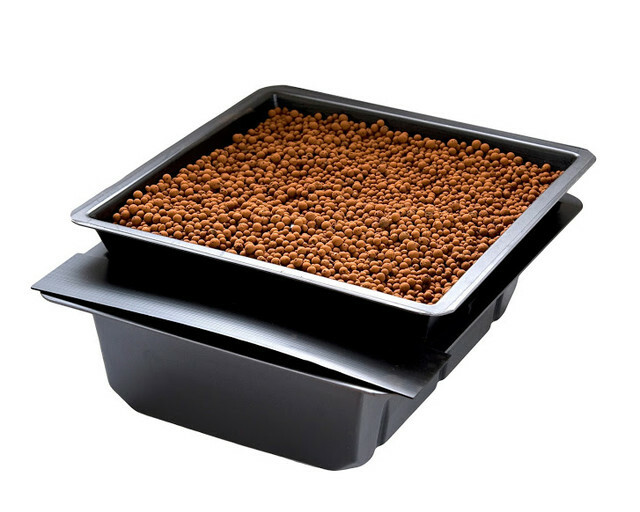 With clay pebbles in your Ebb and Flow growing system, you should treat it as a recirculating hydroponic system. This means topping up your tank with half strength nutrient solution every few days. For absorbent media, full strength solutions will ensure that you can minimise run off. Make sure to provide your pots with enough space between them. Keep light away from the root zone by cutting holes in the correx top plate, which allows them to sit through. Additionally, you should cover the planter base with a spreader mat so that your plants’ roots grow out of the pots and grow onto the spreader mat. If you want to know more about Ebb and Flood growing systems or about our other products, make sure to contact us - we’re always happy to help.